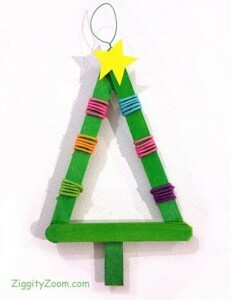 This Christmas ornament project starts with colorful popsicle sticks. As you can see, you and kids can become as creative as you want. 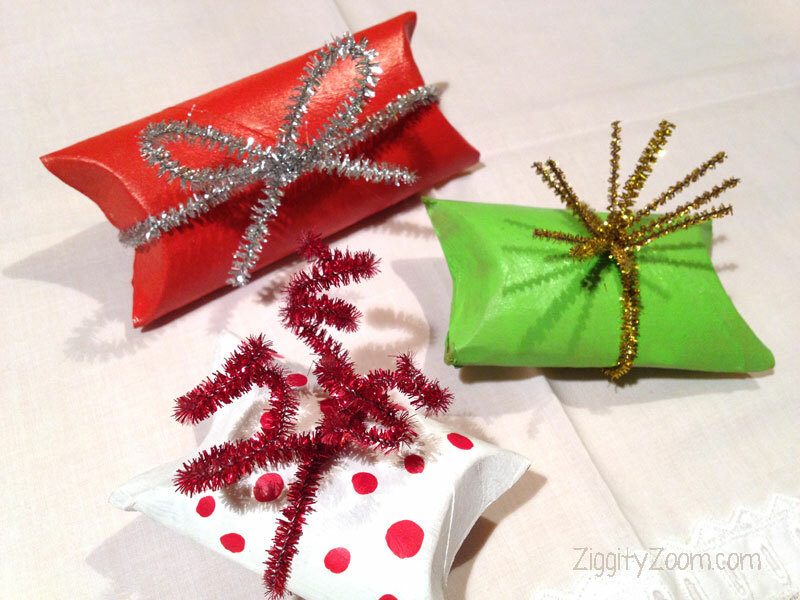 This is a fun holiday project that only takes about an hour. Half of that time is letting the glue dry, but while that is happening you can be making the stars for the trees. 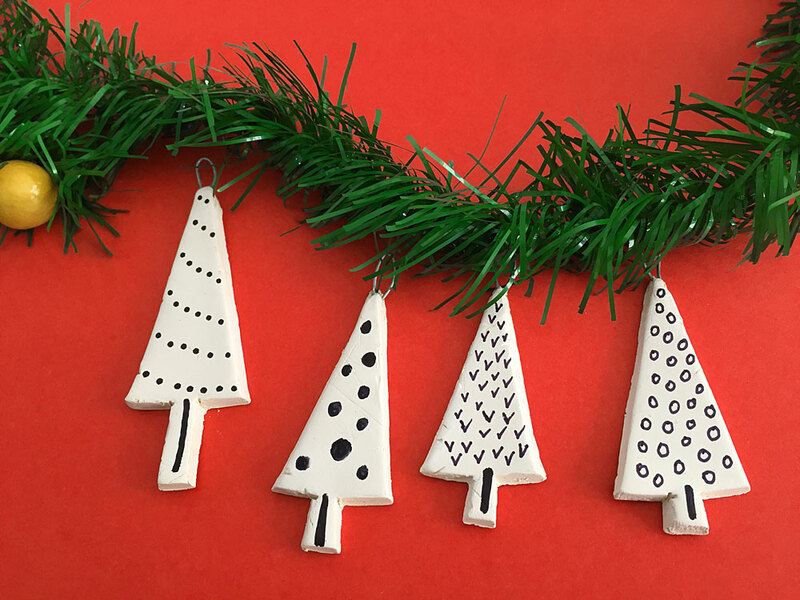 These little tree ornaments will look really great if you decorate an entire tree with these, especially using all the different colors. We plan on giving these as teacher gifts … they turned out that cute and the kids love giving something to their teachers that they have actually made. 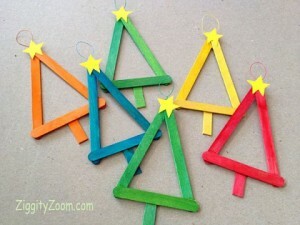 It would be fun to have an Ornament Making party with friends or let the kids invite a friend or too to join in the fun. 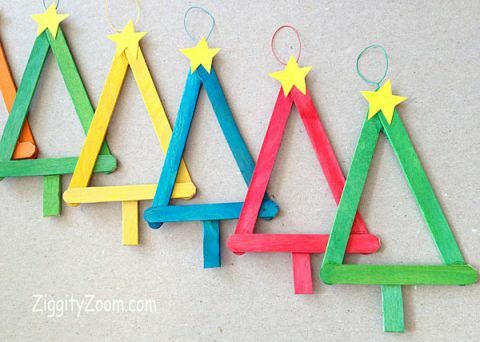 Select three popsicle sticks of the same color for each ornament. 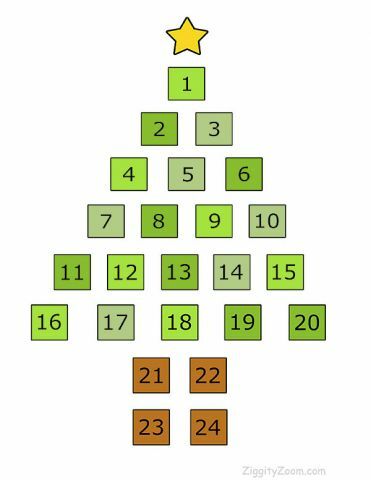 If making elongated trees, cut about an inch from the bottom stick of your tree. Notch off the corners a bit so it is more rounded on the end. Use the cut piece for your tree trunk. Now, using just a dab of glue at the corners, first attach the two top sticks, then lay the bottom stick across the two side pieces, with the trunk underneath. Press down on each glued spot gently. Let dry approximately 1/2 hour. We like the UHU glue, available at many craft stores, as it is pretty fast drying and gives good adhesion. While the trees are drying, cut out stars that are about 1 inch across. 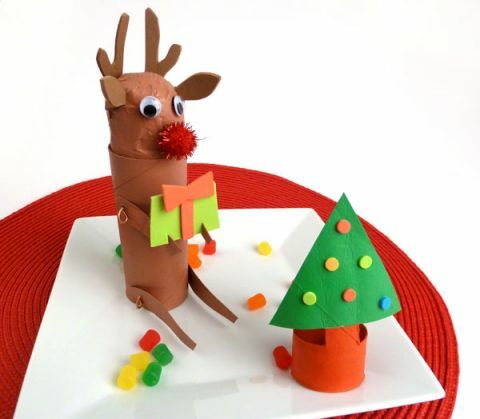 Use the cardstock or then craft foam for this purpose. 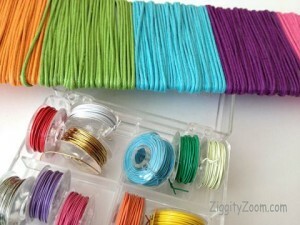 Do not glue in place until you add the hanger first, which you can make from the wire, yarn or cord. Cut hanger from selected material, to about 5 inches long. Loop inderneath the top joint and then tie right above the tree so the hanger will stay secure. Glue stars in place. Let dry. Add decorations as desired. 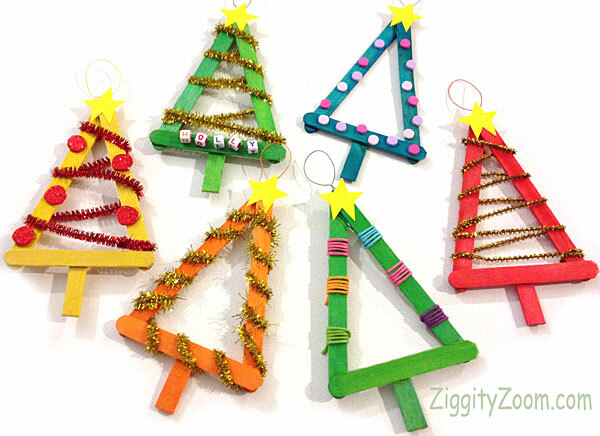 For tinsel look, add a glitter pipe cleaner, bending and folding around the tree, as shown.